Kara Caine Lawson has worked hard to become the woman she is-wife, mother and successful shop owner. Having survived a turbulent childhood, Kara understands that life could've just as easily gone another way . . . and even if she isn't gliding through the trials of lost library books, entitled customers and routine date nights, at least she's not sipping a Dewar's all day like her mother did. But then Kara unexpectedly encounters paintings by her now-famous college boyfriend just as she's beginning to suspect that her daughter Henny's difficulties may be the sign of something serious, and all of her past decisions are thrown into dramatic relief. Kara's narration, at turns heartbreaking and hilarious, captures the imperfect thoughts we have about ourselves and those around us. Rebecca Land Soodak's debut novel asks the difficult questions about the choices we make while revealing the minute details that end up defining our lives. 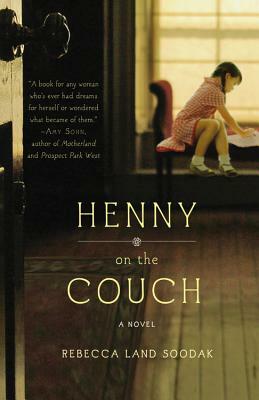 Rebecca Land Soodak, a former psychotherapist, lives with her husband and four children in Manhattan and Litchfield County, CT. HENNY ON THE COUCH is her first novel.